Microfiber cloth is the newest in cleaning technology made from two types of micro fibers, Polyamide(20%) and Polyester(80%). These ultra soft microfiber cloths will lift and trap dirt and moisture, leaving a clean, dry and polished surface without the use of harmful chemicals. A microfiber is an extremely small fiber no more than 100th the size of a human hair. There are approximately 90,000 microfibers in 1 square inch of fabric. These fibers are woven together and then split into wedge-shaped filaments. This drastically increases the cleaning surface area. 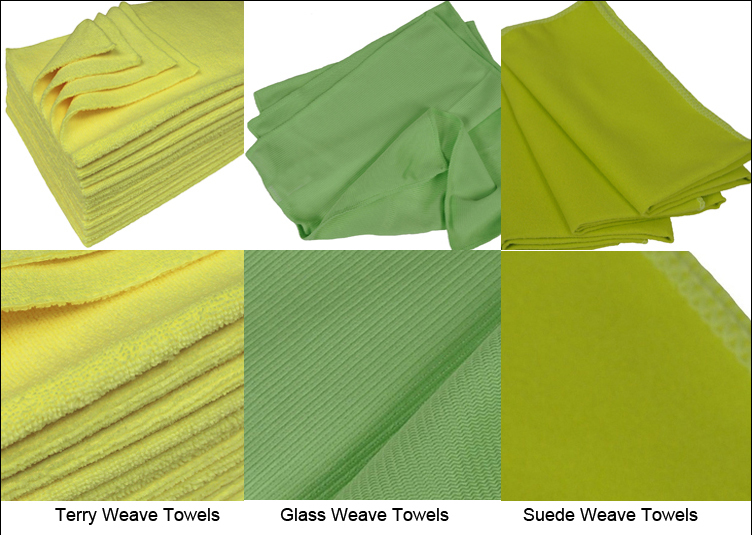 Microfiber cloths can also be used either wet or dry. Use them dry, and they will work like magic without scratching, streaking or leaving lint behind. Microfibers works by attracting dust and other contaminants like a magnet and trapping them within its very fine microscopic filaments. The microfibers actually "pick-up" particles as opposed to pushing them along. Use them wet and they will absorb 7 to 8 times their own weight in water. Due to their superior quality, these microfiber towels can be washed and reused hundreds of times. CARE INSTRUCTIONS: Machine wash. Tumble dry low, and do not iron. Do not use fabric softener as this would clog the microfibers and reduce performance. Do not use chlorine bleach. Wash with other non linting materials to maintain proper dirt-gripping properties.